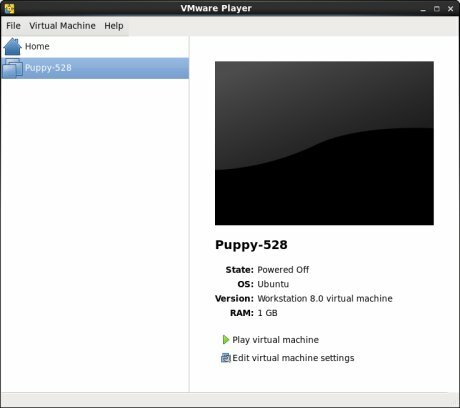 VMware Player is the very first virtualization product I ever used. Way back in late 2005 and early 2006, there were not that many mature or friendly desktop virtualization products available. 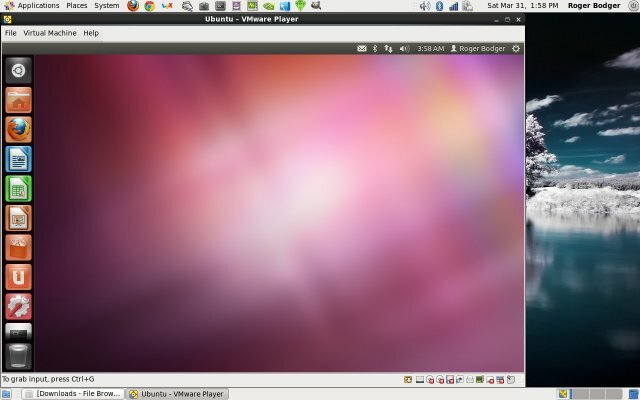 VMware Player, at version 1.0, was all a fledgling geek could hope for, simple, elegant, bursting with possibilities, free no less. It was a rudimentary but fun ride. Fancy stuff like virtual machine creation, 3D acceleration and other sci-fi options did not exist back then; you had to use third-party tools. The program was just what its name suggested, a player. Fast forward to 2012, and we're at version 4.0. Today, I am going to give you a proper review, seasoned with all the spice of virtualization I've accumulated over the years. 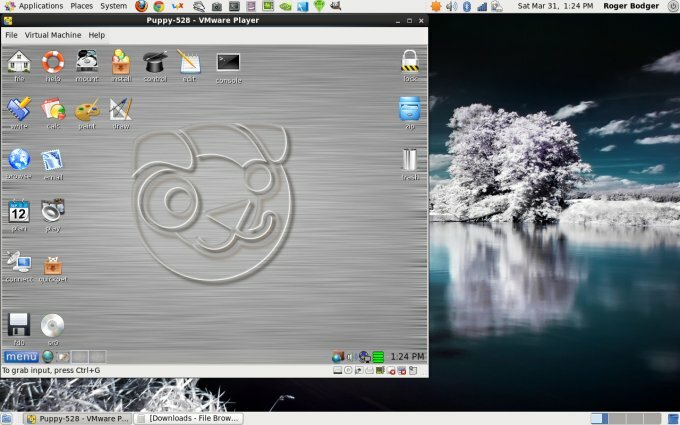 We'll see how it works on CentOS 6.2, 64-bit and go through some of the features you can use. VMware Player is supposed to be the technology demonstrator intended to sway you over into buying the more powerful and infinitely more expensive VMware Workstation, but perhaps the Player is all you'll ever need. The program installation is very simple. It's a GUI wizard, quick and hassle-free. You can see a little more on the installation setup in my second CentOS pimping guide. The best part is, every time the program is started, it will recompile its drivers to match your latest kernel update, or if you wish, you can reinstall fresh from scratch. Your settings will be preserved. Creating and running new operating systems is trivial. Some of the guest machines will support the so-called easy install, which allows you to perform unattended setups. For instance, Ubuntu is supported this way. You can always opt for a manual install. VMware Player lets you connect all kinds of removable devices into your guest, including webcams, printers, network adapters, and others. Not to be confused with the Unity desktop interface featured in Ubuntu, although you can run Unity (OS desktop) through Unity (VMware Player), which creates a recursive meme Xibit style - yo, dog, we heard you like Unity, so we put Unity in your Unity, so you can desktop while you desktop. Sort of like that. This works well, and if you liked that in VMware Workstation, it comes for free here. Here's Banshee on top of CentOS. 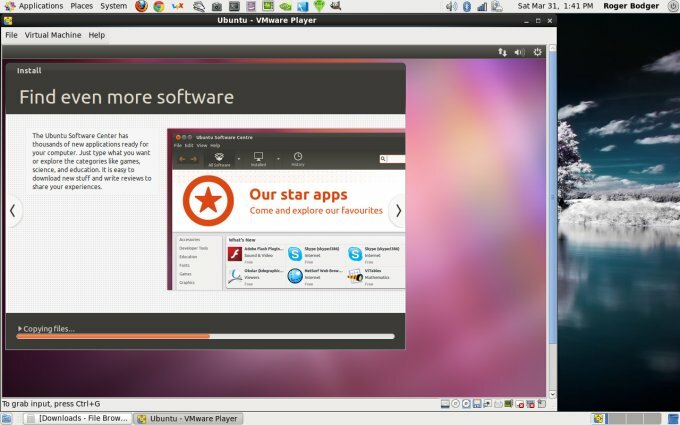 Two different desktop interfaces coexisting most peacefully, with the brown border and a small brown VMware logo embedded into the application window bar marking the guest applications. 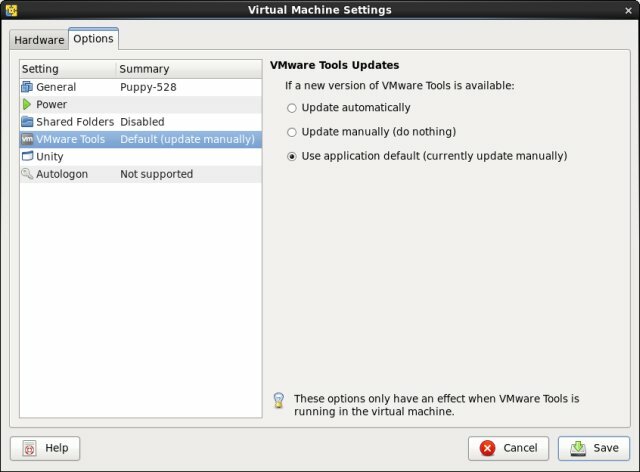 Now, you will need to configure VMware Tools for this to work as you want. 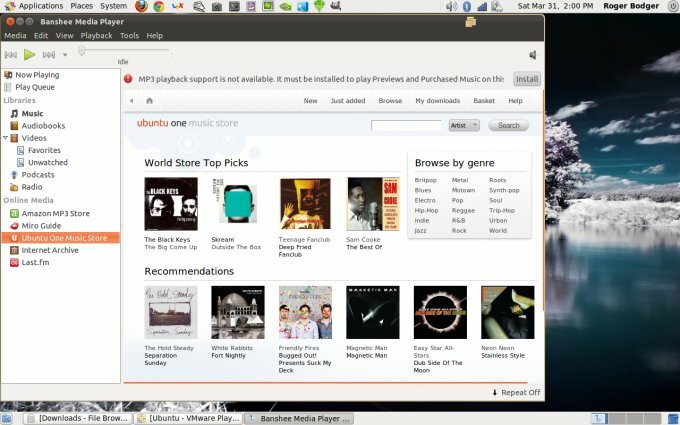 However, Linux operating systems supporting easy install, like Ubuntu and Mint, will have the drivers included in the repositories, so you can enable them using the Additional Drivers (Jockey-GTK) tool. In other systems, you can automatically download and mount the Tools image, then perform a manual installation and setup if you wish to make use of the extended features, which include resolution auto-resize, drag & drop copy & paste in and out of the guest, seamless mouse motion, and even 3D acceleration. All of these and more can be configured per machine or system-wide, with a high degree of granularity. 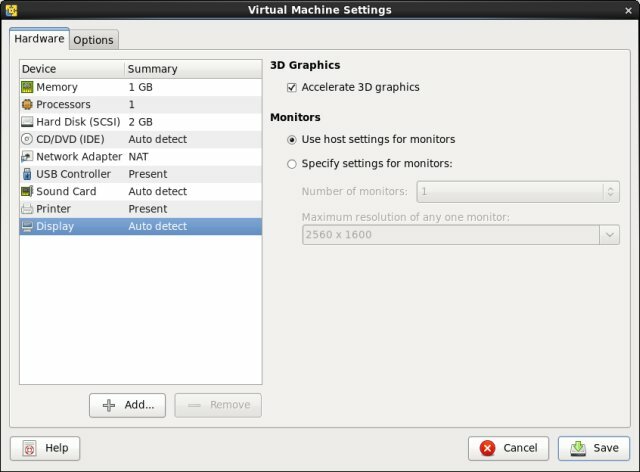 For example, you can setup custom resolution and the number of monitors, auto-updated VMware Tools, auto login/logon, and more. One thing missing is the screenshot feature. And you cannot take image snapshots. These last two things were the main driver that led me to use another VMware product, the free Server, back in 2006, but since the gaps have narrowed down, although they remain. I'd guess on purpose, otherwise, no one would have any incentive to buy the Workstation. Let's not forget the built-in update function, which will often remind you to buy the Workstation, the rich and useful Appliance Marketplace, as well as convert your physical machine to a virtual one. However, this will prompt you to download the Converter. All in all, you get lots of things, but some are available only as addons and separate program downloads, making the Player into a promotional slash awareness raising product. Luckily, these extras do not detract from the pleasant and fairly complete virtualization experience. 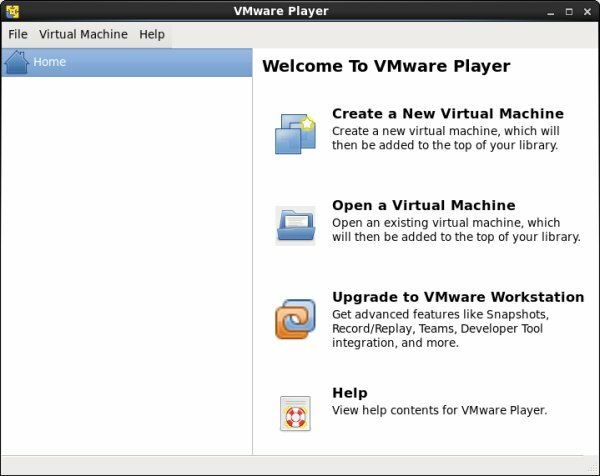 VMware Player 4 is simple and elegant, fast and robust. It is rich in features and options, including the much-coveted Unity mode and 3D acceleration, which should be ideal for people who want to run old and legacy Windows games as well as those who want a smooth and modern experience for their latest operating systems. Some things are missing, most notably screenshots and snapshots. 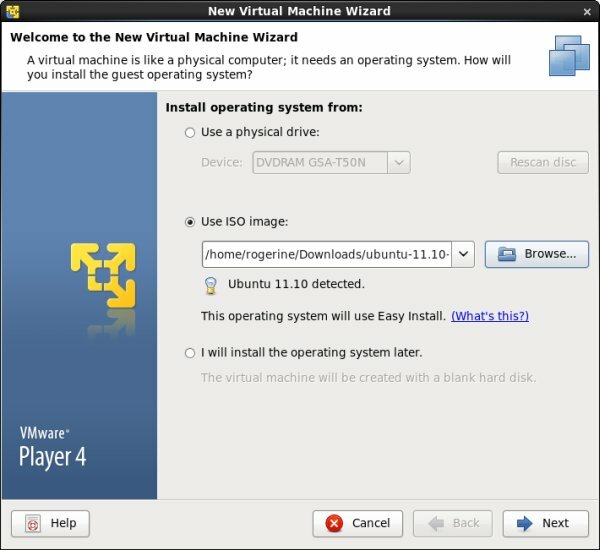 Overall, VMware Player 4 is a very good product for the average virtualization junkie, offering decent but not perfect experience in return for zero money. Its strong points are the simplicity of use and a high degree of automation, plus good support for removable devices. Some of the competition out there plays on its weak spots, but VMware Player is first and foremost designed to shed light on the company's desktop solution workhorse, rather than go head to head with the rivals. For the home user, who shies away from intrigues and comparison charts, VMware Player is a very good choice. Subtle nuances only become apparent after prolonged use. To my delight, there were no big issues or nags. VMware Player works hassle free. And version 4 is a quantum leap ahead of its early 2006 release. Which brings in a tough question; do you really need the Workstation when the basic product is so good? Indeed, you will fret with that one. For the time being, a definite keeper, you should download and test. One last question, which must have tickled your tongue from the very start; how does VMware Player compare to VirtualBox? Aha. The simple answer is, it comes down to personal preference, each with its respective share of ups and downs. So once again, download, try and enjoy.